Removable partial dentures are rarely used due to their complexity and difficult specific clinical and lab steps in the treatment of the patient with class I and II Kennedy edentulism. In the present study through two clinical cases, it was shown that both the clinical and lab steps and the manufacturing cost of these types of prosthetic reconstructions could be reduced. For this purpose, new techniques in manufacturing the wax pattern of the removable part of the RPD have been developed in order to facilitate the lab steps and to gain time. This technique is easier, less time consuming and cheaper than classical techniques, and probably equal in term of precision than other more recent techniques. The development of new orthodontic appliances has encouraged a growing number of adults to benefit from treatment. The goal of preventive mucogingival surgery is to increase soft tissue coverage before the start of the orthodontic treatment. 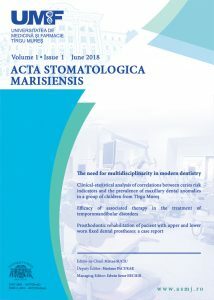 The aim of this case report is to present the clinical outcomes of periodontal plastic microsurgery technique as a pre-orthodontic procedure in a 28 years-old female patient with gingival recessions in quadrant II and thin gingival biotype. After a session of prophylaxis and the cervical lesion’s treatment, a bilaminar technique with coronally advanced envelope flap was performed. The connective tissue grafts were sutured over the denuded root surfaces with resorbable sutures. The sutures were removed after two weeks postop and the healing was uneventful. The results have been maintained during the orthodontic treatment and no dentin hypersensitivity was reported after the periodontal plastic surgery. In conclusion, this procedure represents a predictive treatment of recessions and can minimize further recessions and exposure of the roots during the orthodontic forces. Implant fracture is a rare complication of dental implant treatment, but this complication represents failure of treatment. A case of fracture of an endosseous dental implant occurring in a middle-age woman, 18 months after placement is reported. The implant replaced the mandibular first premolar in a four-unit bridge supported by two implants. The treatment plan consist of placement of additional implants simultaneous with removal of the fractured implant and reconstruction of bone loss. The bone collected from implant placement and implant removal was used to regenerate surgical site.